The Mammoth Book of Astounding Puzzles was compiled by Victor Serebriakoff, the former (late) Honorary President of Mensa. This book of puzzles is enormous & challenging. The book begins with a culture fair IQ test that is untimed & consists of 36 visual puzzles ("The Serebriakoff Advanced Culture-Fair IQ Test"). Your score on the test sets your "handicap" level for the rest of the book, which contains 26 chapters filled with puzzles. Each puzzle has a time limit, & your score is increased if you solve a puzzle under the time limit, although you still receive some points if you answer correctly, but exceed the time limit. After tallying your score for each chapter, you divide it by your IQ, as figured by the culture fair IQ test. The test is in some ways similar to the Raven Advanced Progressive Matrices test, an IQ/aptitude test that I took years ago (very hard to find in the U.S., and frowned upon by many psychologists who call it "exotic," but is a well known test at least in the UK and I believe elsewhere in Europe - it is accepted for admission to the American & UK branches of Mensa, and other national Mensas). The Raven APM also has 36 problems, and can be given untimed, which is the way that I took it. One of the problems on Victor's test is very similar to one on the Raven. I missed Victor's, but answered the Raven problem correctly (it probably didn't hurt that I'd done the Serebriakoff test first...). However, Victor's IQ chart inflates scores, in my opinion, much like many online IQ tests. Oh well, a little ego boost rarely hurts ;-) The test alone is probably worth the price of the entire book. Although I took the test, I never actually used the point/handicapping system, but did try to solve several of the puzzles within the time limits. 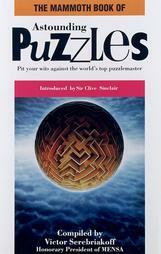 This book contains well over 300 puzzles, which includes just about every type of puzzle imaginable. You'll find mini-crosswords, unfolded cubes (you have to figure out what they look like when whole), gear ratio conundrums, word & number puzzles of all types, & many other puzzles that involve planets, grids, circles, squares, trivia, codes, cryptograms, vehicles, & much more. There is something for everyone in this book! You can find The Mammoth Book of Astounding Puzzles online for purchase here.